It’s not without a certain irony that placing heavy demands on a hot water system – for example, when a boatload of guests are bathing their way through reserves while the galley and laundry are at capacity – can quickly land a yacht in hot water. Moreover, conventional immersion heaters come with their own maintenance inconveniences, not least of which is the tendency for scale to build up on the elements, reducing the effectiveness of the system as a whole. UK company Cathelco HEM believes it has created a solution to all these problems in a form factor that also saves space for equivalent hot water output. The system uses a heat exchanger principle with a closed circuit heating cylinder wrapped around an inner tank, creating a ‘jacket’ of hot water that, claims Cathelco, heats up the cold water feed very quickly. In addition, as the heating elements themselves are fed by non-corrosive and non-scaling water that doesn’t come into contact with the secondary water, the problems of scaling are eliminated. 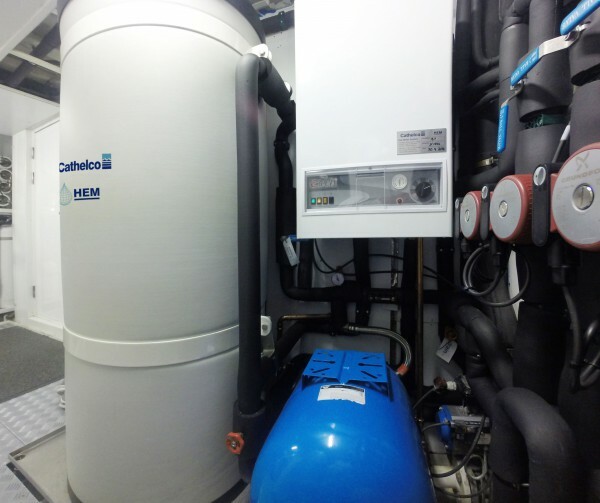 “The advantage of this heat exchanger system,” says Chris Bell, general manager of Cathelco HEM, “is that the cylinders can be much smaller while producing large volumes of hot water on a continuous basis. Basically we are using a small cylinder to produce a greater percentage of heat. As an example, a 263-litre cylinder will continuously deliver over 1,000 litres of hot water per hour.” Further, the equipment can easily be scaled for larger vessels by using tandem boilers and cylinders. Trouble in the engine room?